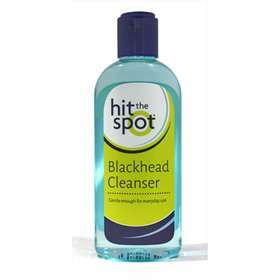 Hit the Spot Blackhead Cleanser helps fight against blackheads in prone areas of the face, nose forehead and chin. Removing dirt, oil and dead cells which can accumulate and worsen problem skin. Cleans pores to prevent further blackheads. Added Vitamin E and Aloe Vera leaves skin feeling fresher. More available Hit The Spot products. Apply cleanser to a cotton pad and wipe gently over your face and neck. Use morning and night as part of your usual cleansing routine for best results. If contact occurs, rinse with lukewarm water. Aqua • Alcohol Denat • Polysorbate-20 • Sodium Benzoate • Glycerin • Parfum • Salicylic Aciid • Aloe Barbadensis Leaf Extract • Cymbopogon Martini Oil • Tocopheryl Acetate • PEG 40 Hydrogenated Castor Oil • Potassium Sorbate • Benzophenone 4 • Menthol • Triethanolamine • CI42090 (Blue No 1) • Linalool • Citronellol • Geraniol • Hexyl Cinnamal.